All the usual disclaimers apply about newness, completeness and relevance (or any other implication of responsibility) :-) but this time the disclaimer about completeness should be stressed a bit more — this is what I have at this time, and I need to get it out today: if you know of other stuff, then please share in answers. The Hungarian Tolkien Society, Magyar Tolkien Társaság, has, for the past seven years, held an annual mail-based competition on Tolkien topics, the TLV, Tolkien Levelezo Verseny. This year, they have decided to add an international category open for contestants between 15 and 35. So, if you have managed to sign up in time, it will be an excellent opportunity to test your Tolkien mettle. The Brisbane Tolkien Fellowship, with coordinator Fortinbras Proudfoot, Esq. (a.k.a. 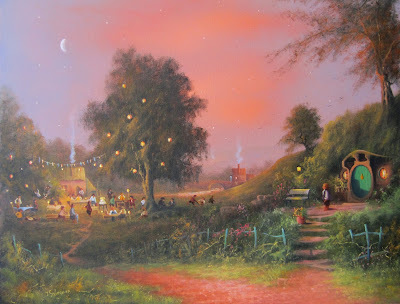 Peter Kenny) is inviting Tolkien enthusiasts and fans and other interested parties to an evening in Middle-earth in favour of the Pyjama Foundation charity. Good luck with the fund-raising! A very nice picture gallery of Tolkien-related places including many of the places where Tolkien lived (though it also includes some of the more dubious ‘usual suspects’ such as Perrot's Folly and the Edgbaston Waterworks' Victorian chimney). Congratulations to the Greisinger Musem! The Greisinger Museum opened in the weekend of the 7-8 September in Jenins, Switzerland, with a great gathering of Tolkien enthusiasts. I would have loved to join the festivities, but will have to do with Marcel's report and putting Jenins on my list of places to visit before too long. A report from the tenth anniversary party, of course named ‘A Long Expected Party’, of the Eorlingas — the Indonesian Tolkien Society. Congratulations to the Eorlingas! The giants and the medieval romances in the title of this 2012 Master's thesis from the Université de Montréal caught my eye (it has been said that Tolkien's The Lord of the Rings in genre terms in many ways is closer to the medieval romance than to the modern fantastic novel). I have scanned the introduction and the conclusion of the thesis, and the applicability for students of Tolkien may be limited, but I still thought it worth mentioning here. ‘The Serpent in the Sword: Pattern-welding in Early Medieval Swords’ (28 Sep). John Garth's paper from Tolkien Studies 7 is here published on-line. David Bratman wrote about it, ‘I have never read a scholarly paper that left me more thoroughly charmed than John Garth's on Tolkien and Hugh Gilson,’ which is far better said than my own terse summary of the contents from my review in Mallorn: ‘John Garth explains that R.Q. Gilson's younger half-brother, Hugh Cary Gilson was the boy Tolkien spoke of in an anecdote in his drafts for ‘On Fairy-Stories’, and in J.R.R. Tolkien and the Boy Who Didn't Believe in Fairies' Garth gives both the evidence and some further information.’ Go read! One of the most interesting blog entries by Bruce Charlton for quite a while. Charlton discusses the provenance of Tolkien's Notion Club Papers, particularly the curious way Tolkien (with great skill, I might add) manages to land somewhere between historical and fictional by suggesting both. A curious essay on Tolkien's Faëry and the traveller therein. I am not entirely sure what to make of this — Dunning appears to have something he wishes to say, but I am not entirely sure what it is. An interesting take on the influence of Wagner on Tolkien's The Lord of the Rings focusing on the transition from Andvari's cursed ring (with no particular influence on the later plot) to Alberich's powerful ring in Wagner's Ring-cycle, and on the transition from Bilbo's simple ring of invisibility to the One Ring. I quite agree that the transition of Tolkien's ring is inspired or influenced by Wagner's ring, though I think Shippey nails it when he calls it a negative influence: Tolkien wanted to do better. We should not forget that Tolkien, as far as we know, only ever saw and heard one of the operas in Wagner's Ring-cycle, and this was after he had read all of them — Wagner's work, I am told (even by some who love it) is distinctly unimpressive when merely read like that, and what little I have read strikes me as being very poor sub-creation (Renée Vink interestingly suggests that Wagner's mode of sub-creation is the music, which seems to me a very reasonable suggestion — as far as we know, however, Tolkien only experienced the music of one of the Ring-cycle operas). I am sure that much work can still be done on comparing Wagner and Tolkien, e.g. on shared influences and shared themes, but as far as Wagner's influence on Tolkien's work is concerned, I believe that everything relevant is said in the above. Well said! Michael Martinez here rejects both the most common criticisms against the representation of women in Tolkien's works and the standard knee-jerk reactions of many fans. The point, as Martinez also concludes, is that there are no, or very few, realistic women in Tolkien's work (at least among those who are more than a quick sketch such as Rose Cotton). With a Mythopoeic Society collection on women in Tolkien's works putting the issue on the more serious critical agenda, it is good to see a considered, and relatively brief, statement such as this. The Southampton Tolkien Reading Group (Southfarthing Smial) continues with Garth's Tolkien and the Great War, this time chapters 11 and 12, with a bit more than the usual detours. As always the discussions are full of insights and interesting perspectives. I cannot go the whole way with Michael Martinez in this question, but he has some very perceptive insights, including the point that elements of the transition of Bilbo's ring to the Master Ring borrow from the Silmarils. As for the larger question, I think think it is foolish to reject the idea that other aspects of this transition derive, whether consciously or not, from Wagner's treatment of the old Germanic legends. I have, however, not seen any convincing arguments that other aspects of Tolkien's work than the transition of the Ring should derive from Wagner. We know that Tolkien was reading at least parts of Wagner's ring-cycle (and that he watched a single of the operas of the cycle), and my impression is that Wagner's story-telling and sub-creation, if read in this way, is distinctly unimpressive. Alison Milbank, Joseph Pearce, and Ronald Hutton join with Ernie Rea for a talk about the enduring appeal of Tolkien's work (particularly The Lord of the Rings), and as a bonus there is a pre-recorded interview with the actor Robert Hardy who studied under both C.S. Lewis and J.R.R. Tolkien at Oxford. They have a truly fascinating discussion about the pagan and Christian symbology in The Lord of the Rings, though I am sorry to say that Joseph Pearce does not come across here as particularly perceptive in his reading of Tolkien which in many instances seems to me forced (I am not sure if that is the right word — it seems to me that he is squeezing Tolkien's work into a shape that will fit the mould that he has in mind). As it says, a call for papers for an upcoming (December 2014) collection titled Tolkien and the Classics that will, of course, investigate the relations between Tolkien's writings and the classics. I hope the book will be released in English as well, or at least that the papers submitted in English will become available in that language. Douglas A. Anderson writes about some of the problems facing authors of popular books on Tolkienian matters when they find their work translated, both in general terms and with regards to a specific translation. Seeing the problems introduced in this particular translation, and remembering the comments Tolkien had on some of the translations he was able to read, one can wonder what happens in translations where the author has no chance of checking what is published in their name ... In related news the comments show the great helpfulness general found among Tolkienists, which is really good to see! I suppose that the headline says it all — issue 5 of Silver Leaves sub-titled ‘The Hobbit’ is now available for order. My review will follow when I've had the time to go through it. A new edition of this children's book by Tolkien edited by Tolkien specialists Christina Scull and Wayne G. Hammond. About a new book, The Riddles of The Hobbit, which is a critical discussion of the riddles in The Hobbit by Adam Roberts. Though somewhat surprised not to find any mention of the Saga of King Heidrik the Wise, I am intrigued by the review here. As announced last month — a wonderful and charming interview with various of Catlin's illustrations for The Hobbit and the story of how she got to be chosen for the job. 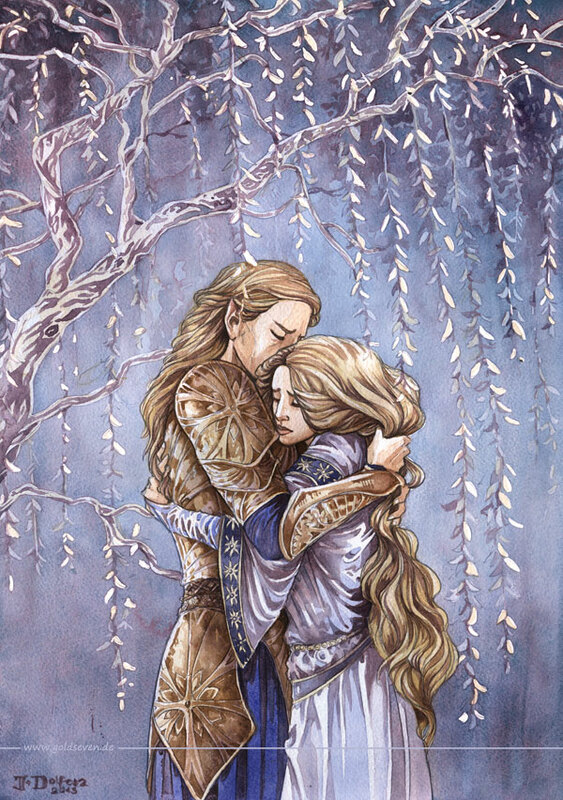 A meeting of Finarfin and Galadriel, father and daughter, about the time of the War of Wrath (well, depending on the version, but before Galadriel went further east with Celeborn). This picture by Joe Gilronan is, to my eyes quite nice — though it doesn't really match up with anything in Tolkien's story, there is an air to the picture that is nonetheless reminiscent of Ithilien. Michael Martinez is back with his series of short(ish) answers to story-internal (or ‘Ardalogical’ if you're more familiar with the Unquendor term) questions. This kind of discussions is not my main focus with these transactions, but I wanted to highlight that Michael has started blogging his answers again (and you will find references to a couple of less story-internal questions above). A curious article in which the author gives a fairly reasonable summary of some aspects of Tolkien's Orcs (obviously much more can, and should, be said about them than this) and particularly how Tolkien himself used the image of the Orc in contemporary commentary. The text itself is, despite its lack of depth, uncontroversial, but the use of portraits of modern politicians to illustrate the text may be seen as rather more controversial. I've been debating internally whether to include this piece or not, but in the end I've decided it is better to set some things straight. There is no evidence suggesting that Tolkien visited the Lydney Park dig, actually what little evidence there is (all of it circumstantial) suggests that he did not visit the dig. Similarly there is nothing to suggest that Tolkien knew of the gold ring that had been found elsewhere at another time — Tolkien's only involvement was the name Nodens, and the ring offers no link or clue to this name. All in all careful analysis leads a rational student to reject the ideas presented here (unless and until, of course, further, and far stronger, evidence should be discovered). A look at languages through the lens of constructed languages (conlangs) and particularly Tolkien's Elvish languages. Apart, possibly, from some of the other conlangs mentioned, there is little new to the dedicated Tolkien student, but the presentation and the animation adds something here, making it worth watching. I've listed the Norse Mythology Blog before, but I hadn't realised that there is a large on-line library on Norse (and related) topics ... enter at your peril — or at least at the peril of your time! A list of Kristine Larsen's writings on this topic, a number of which are available on-line in which cases the list includes a link. 1 Tolkien-related post in September 2013, mentioned above. 3 (+1) Tolkien-related posts in September 2013 — in addition to the three posts mentioned above, there is a post with various pictures from Tolkien-related events and travels. The closest to a Tolkien-related post in September 2013 is the 7 September ‘rename notice’ that explains that the name of the Livejournal is now spelled correctly, ‘Kalimac’ — the Tolkien relation of course coming from this name and the associated explanation for the name. A single Tolkien-related posts in September 2013 (see above) — apart from this, Jenny Dolfen has been pursuing Hannibal this month, which is definitely also worth taking a look at. A single post in September 2013 about watching the New Line Cinema version of The Fellowship of the Ring with a live philharmonic orchestra playing the music. A single review of two Lewis books is the only post in September 2013. A single Tolkien-related post in September 2013 on Hobbit Day. 16 Tolkien-related posts in September 2013 including the three posts mentioned above.